St. Patrick’s Day: an excuse for all things green and minty. Like mint Oreo donuts from Dunkin Donuts. 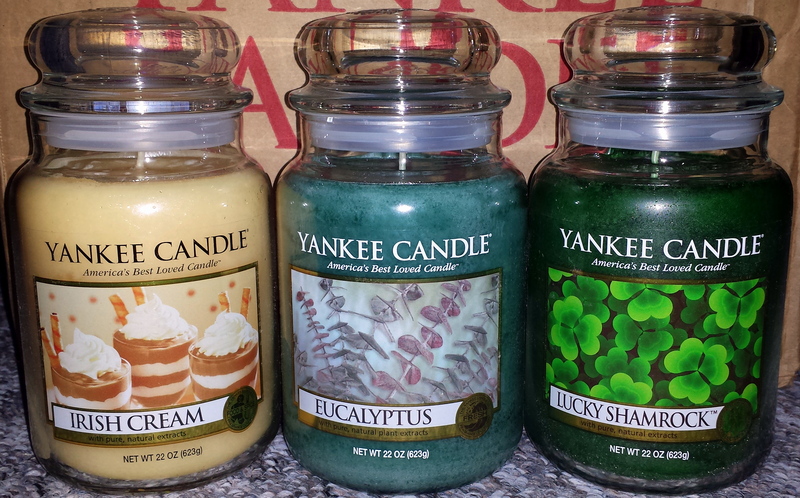 And candles. 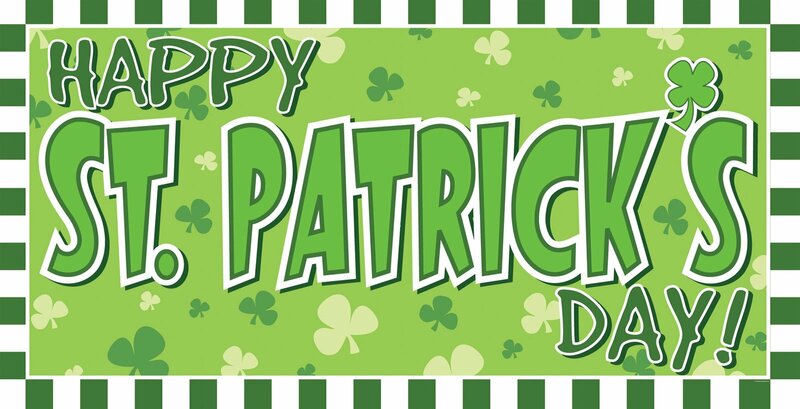 Well, St. Patrick’s Day will arrive tomorrow on March 17th, just as it does every year. I have nothing against jolly old Saint Patrick, but as a kid, I remember the schools liked to push it as a big themed holiday, but I knew that it wasn’t. Sure, there were lots of activities involving cutting out shamrocks, coloring them green and having discussions of leprechauns & gold but that’s really all there was to it. 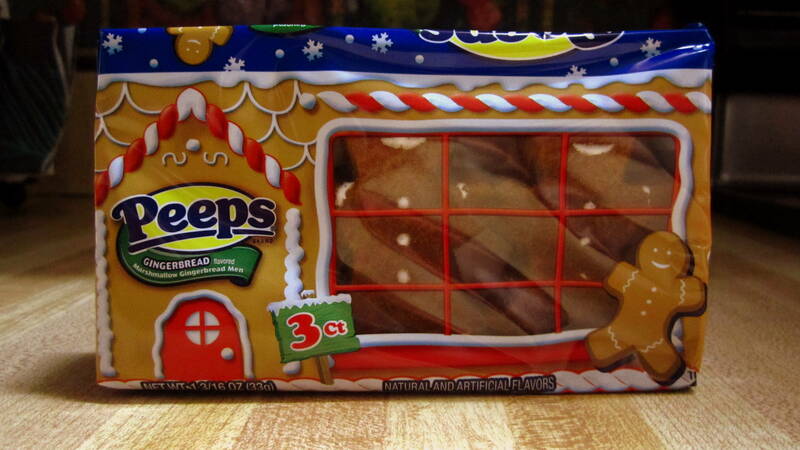 Christmas, Halloween, Easter, Valentine’s Day and Thanksgiving all offered food, gifts and candy. Looking at the holiday from a purely superficial point of view (the only way I look at any holiday), St. Patrick’s Day had/has very little to offer, really. When you’re a kid, St. Patrick’s Day is just a reason to wear green. It’s mass color coordination across your school and if you’re the one kid who goes to class and doesn’t wear something green, you’re going to get pinched. A lot. Well, maybe just a few times. Actually, is that still a thing? I remember it was a thing when I was in elementary school. When you’re an adult, St. Patrick’s Day just seems like a good excuse to eat and drink on a work night and puke up green beer. Then when you’re hungover next morning to you can eat Lucky Charms. Still, lots of green stuff and mint-flavored things pop up during the month of March. Bakeries come out with cupcakes with green frosting or shamrock-shaped sugar cookies with green sugar crystals sprinkled on top and everyone decides they need to buy a box of thin mints from a Girl Scout, Irish creme coffee creamers skyrocket in sales and you might find a bag of gold chocolate coins in the candy aisle, but it’s McDonald’s that truly has the market cornered with their Shamrock shake. 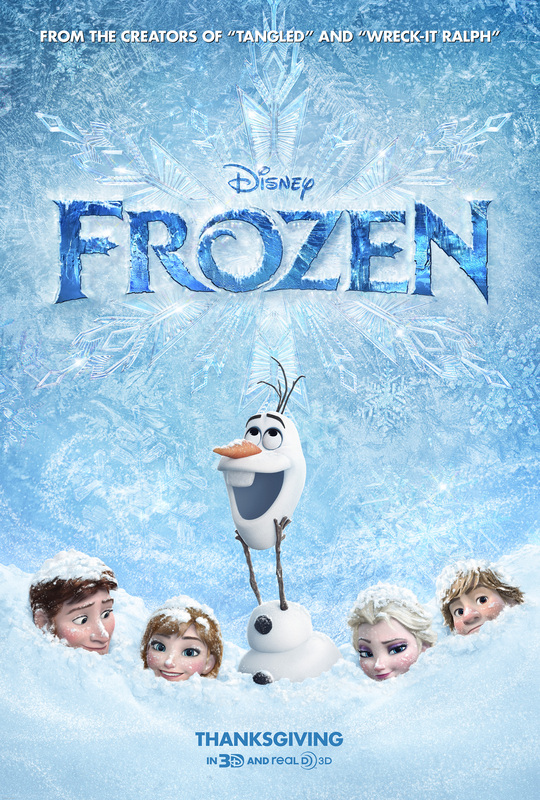 Taking inspiration from Hans Christian Andersen’s “The Snow Queen” fairy tale, Frozen is one of those non-holiday holiday movies. It was released on Thanksgiving Day and the holiday season doesn’t factor in at all. It even takes place during summer. But… BUT, the movie does spend most of its time with the land covered in ice and snow and it features a reindeer and a talking snowman. So many of Disney’s animated movies are Pixar productions these days that I forgot how much singing happens in true Disney animated films. Within the first 15 minutes or so, the characters had already broken out into three songs. All of the singing certainly does remind you that you’re watching a Disney film. The reviews for this one have been really good. So good that people are putting on the same level with The Little Mermaid, The Lion King and Beauty and the Beast. I don’t know… It’s hard to say it’s that good. I grew up watching those movies and when you’re a kid, a movie seems so much more special and magical. I think I’m too old by this point to enjoy a movie that much and for it to be able to stand toe-to-toe with nostalgia. Still, I liked the movie a lot. It’s a great looking film. Then again, snow and ice is always beautiful to me. It’s just as good, if not better, than Wreck-It Ralph. It is a much more traditional Disney animated movie whereas Wreck-It Ralph seemed like it was trying to imitate Pixar. Before the film, a new Mickey Mouse short was shown called “Get a Horse!” It’s the first original theatrical Mickey short since 1995. It combines the old black & white style of Disney shorts with color and CGI. The execution was interesting but the short itself wasn’t. I’m sure it will be on the home video releases. 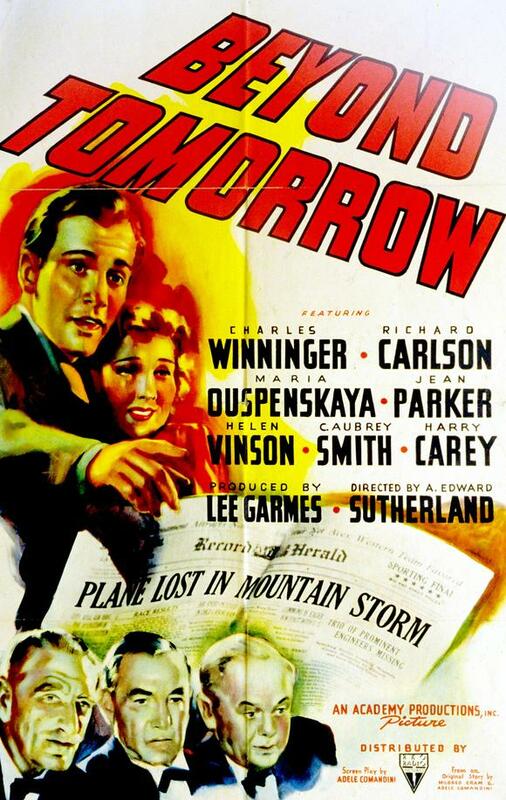 This movie had an interesting yet somewhat dark and complicated idea. Three lonely old men end up meeting a young man and then a young woman on Christmas Eve and they all spend the evening together and become friends. The young people fall in love, the older gentlemen die in plane crash (!!!) and then come back as ghosts to help keep the young couple together. It’s trying to be a heart-warming tale but with the plane crash and then sending one of the ghostly men to hell later on and another being shut out of Heaven after refusing to leave until the couple gets back together… it’s just weird. The actors and character are likable and there was potential here for a true sentimental Christmas classic, but it feels kind of slapped together and a bit dark at times. I love the film’s score though. The movie is in the public domain, so you can find it cheap on DVD (and easily online for streaming) but 20th Century Fox released a colorized version in 2004 and retitled it Beyond Christmas. I wouldn’t mind watching the colorized version because the version I watched on DVD definitely needed some restoration work. 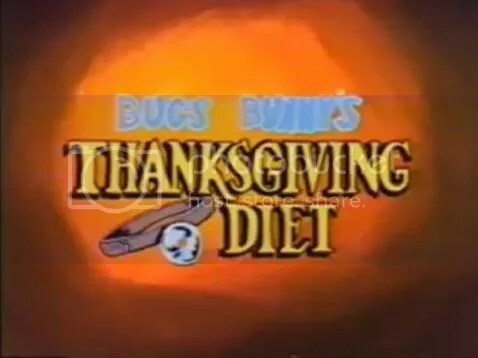 Bugs Bunny’s Thanksgiving Diet is a 24 minute holiday special that aired November 15, 1978 on CBS. Like many of the Looney Tunes television specials, it’s a clip show that features excerpts of these Looney Tunes shorts: “Rabbit Every Monday” (1951), “Stop! Look! and Hasten!” (1954), “Guided Muscle” (1955), “Beep, Beep” (1952), “Tweet Dreams” (1959), “Trip for Tat” (1960), “Birds Anonymous” (1957), “Canned Feud” (1951) and “Bedeviled Rabbit” (1956) with some new animation to interspersed throughout to tie it all together. 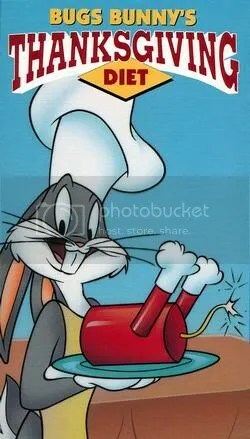 In the original animated portions that set up the clips, Bugs plays a doctor (a food psychiatrist apparently) who takes on such patients as Porky Pig, the overweight Millicent (female rabbit that originally appeared in 1957’s “Rabbit Romeo” short), Sylvester the Cat and Honey Bunny. I know there have been complaints over the years about Warner Bros. taking the low-budget approach to these specials from the ’70s and ’80s by re-using old footage but given how they are introduced during these shows and the fact that I was a kid when I first saw them, I have no problem with them. I think Warner did a good job with these kind of shows where basically the old shorts are almost always presented as flashbacks. There is always a story being told with the new animation as these specials open and close with new material while using the new animation to also introduce each short. Sitting here now watching this again I’m having a blast with “Rabbit Every Monday” (Yosemite Sam tries to roast Bugs in a wood stove), “Canned Feud” (Sylvester is locked in a house and needs a can opener to open up all the cans of tuna but a mean-spirited mouse has it) and “Bedeviled Rabbit” (Bugs in drag vs. Taz). Those two shorts were always my favorite from the bunch. While a number of Looney Tunes TV specials have made it onto DVD either as bonus features for the Looney Tunes Golden Collection or as stand-alone releases, Bugs Bunny’s Thanksgiving Diet has not yet seen the light of day. Warner Bros. seems to take great care of their Looney Tunes/Merry Melodies shorts so I’m sure it’ll pop up either in the Looney Tunes Platinum Collection (Golden Collection’s Blu-ray successor) or a Looney Tunes Super Stars (a less prestigious DVD-only line) set. The only reason I say this so optimistically is because Bugs Bunny’s Looney Christmas Tales has been on DVD since 2007! I’ve wanted that special for YEARS and somehow completed missed that it’s already been available. While some purists may scoff at these cartoons being altered and edited down into a 24 minute Thanksgiving special, I grew up with this show and had it recorded VHS copy when I was a kid. This show was right up there with A Charlie Brown Thanksgiving in my house. I loved it then and I love it now. Happy New Year, Charlie Brown, have some Chex party mix! Did everyone watch Happy New Year, Charlie Brown last night on ABC? I’ve been wanting to get that I Want a Dog for Christmas, Charlie Brown DVD because it has Happy New Year as a bonus feature, but luckily I saw it was going to be on TV last night so I made sure I sat down to watch it. I should’ve made some Chex party mix to go along with it. Snoopy sniffing Lucy’s root beer and Rerun blowing up square balloons still made me laugh and I help but feel sorry for ol’ Chuck as he fell asleep and missed the girl of his dreams coming to the party. My girl wondered why he was the only one worrying about the book report when everyone else had the same assignment and were partying like it was 1999 and I told her its because worrying is what Charlie Brown does. I’m pleased to say this classic from my childhood has held up well and I’m glad to see it making it to TV again. I don’t remember it being on TV for a long time, but maybe I’m wrong.